Just ME: Potted Pretties, first look and giveaway. Potted Pretties, first look and giveaway. Today is such a special day for me... the day I announce that I am not a one-hit-stamp-designing-wonder! ha! I am pleased to give you the first look at the new set I illustrated for Mama Elephant, just in time for spring, called Potted Pretties. 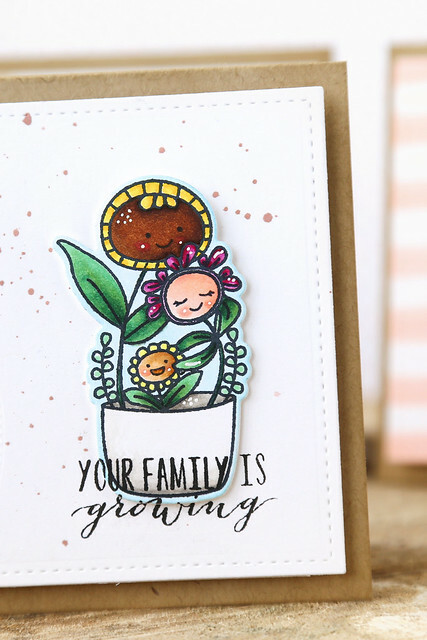 I made a card set so I can show off the 4 plants and the sentiments that go with each one. The giant strawberry is the best of the bunch! She comes without a face, but if you carefully wipe off the top of the round circle image, you can add in a face. And I always think images are cuter with a face on them! 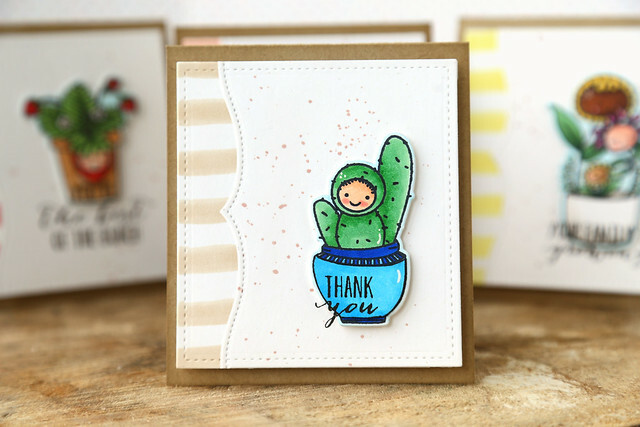 The round face stamp is actually designed for the cactus. Isn't he cute? I wiped off the design on the inside of the pot so that I could stamp the sentiment inside to match the rest of the cards in my set. These little flowers are playing peekaboo around the leaves. I love the "i've been missing you" sentiment! They look like they can't find each other. The last image is the one that sparked the entire set. I found out both of my sisters were expecting babies this spring/summer and it sparked my imagination to doodle this image. Here, I colored the flowers to match my own family's skin colors! I'm imagining my indian husband, my light greek skin tone and my kids with their beautiful mixed hues. hee hee. I'm enchanted -- so precise and whimsical -- designs put a smile on my face! So sweet! I love this set! You did an amazing job with it! I think these are so cute! I love that they all work with or without the cute faces! I love your cards and this stamp set is adorable! Congrats! Congrats on this set of gorgeous images, so sweet and whimsical. You did an amazing job, love it!!! Fabulous Elena! Beautiful coloring and designing! Thanks for the chance to win your new set! Congrats on illustrating again for ME! Love your sweet, whimsical style! oh, love this set! and your cards are just gorgeous! This stamp set is so super cute and I can't wait to get my hands on it! Congratulations for your design. I would love to see more of your creations. Big hugs. Congrats on your new stamp set, Elena! You've done an amazing job creating these pretty images, and I love your cards!!! congrats on another great set...I had no doubt you would be successful after seeing your cute digis from way back. I love this cute potted set. Such sweet cards too. It must be exciting to see your artwork in a real live stamp form. I've been seeing more plant related stamps on the market - it must be SPRING. It is nice that you can add the faces to the plants but you can have them without them. I wish that I could draw but oh well that is why I buy stamps. The set is beautiful and so is your work! This Stamp Set is so cute, your Cards are awsome. You are so talented ! This is by far one of my favorite sets to be released by Mama Elephant. I am in love with all the adorable images! Love your cards. So cute! Congrats!! Congrats on another fantastic set, Elena! It's super sweet, and your cards are so beautifully colored! These little "Potted Pretties" really are so pretty. I love this stamp set and the sentiments included in the set. So great! Very cute cards. Love the images. The sentiments work perfect with the stamps. Oh, what a super sweet set, Elena! And those fonts are gorgeous, too! Congratulations! Those stamps are just the cutest. thanks for the chance to win a set. I can't get my name to appear in the comment as button so I will just use unknown and check back when you post the winners in case I am lucky. What a sweet stamp set! That's a really cute stamp set! I like the way you colored the flowers according to your family's skin color. My family is mixed too so it's a great idea for me to do too! Thanks for sharing. I love this stamp set and the sentiments included in the set.Love your cards also!! Ooooo amazing job Elena! I love this set! The stamps are so cute, and the cards are adorable too!! Thanks for doing this giveaway! ;) can't wait to see what you design next! Love hoe whimsical this stamp set is! It is the cutest! These stamps are amazing!!! They are so sweet!!!!!!!! I lpbe tour cards toó!! Absolutely love this stamp set! So cute and the card ideas are running through my head like crazy! Oh, these are so cute and original ! Hope they'll be available in the UK soon ? Each one of them is sooo cute! These little faces are irresistible! Just darling! Super adorable stamp set! Love those little faces. Elena, these are sooo cute!! I think it's a very charming little set. You cards were darling. I love the stamp set. They are adorable and very charming. I would love to have a chance to make cards with them. Such a fun set!!! Love what is showcased and those faces are adorable!!! Awesome cards! Love this sweet set! Such adorable faces! they are so so cute 😉 you are so creative !!! Absolutely adorable. Love the cute babies. Congratulations! Great job - love this new stamp set! This set is awesome! I love your last card, very special! This stamp set is adorable! I love the lil faces and the plants are so sweet and pretty! This is such a darling set, must have! How exciting and congratulations!! These are absolutely adorable and love all the different flowers, their faces are too cute!! I loved this set from the moment I first saw it and now that I have seen your beautiful and supercute card I love it even more. I would love to win it - thanks for the chance. So bumbed!! it always happens, an awesome new release after I've made a large mama elephant order... love the card design too. You're "Family is growing is the best!" I love the way you did blended families. And I'm a sucker for strawberries. Mama Elephant has new and innovative ideas when it comes to the stamping/die world! How pretty! I love the set of cards you created, especially how the top layer is cut on a curve. Elena this set is so precious (especially with the faces!) I love the strawberry but after reading your captions I can't help but to fall in love with the final family image. Thank you for designing such a sweet set!!! How beautiful and adorable. Compliments! OMG, your cars are so funny and cute. I love your coloring !! Love all the details on your pots. So cute. I thought this was a really nice set when I first glanced at it but really fell in love with it when I realized the adorable faces were part of the set! Such a wonderful, versatile set! Great job! Very sweet set and I like the faces. What a very sweet and whimsical Stamp and Die (yeah I love a matching Die) Set. I am so touched, and impressed, with why you colored the last image differently. I also feel that this last image is the Focal Point, and the reason, for your Stamp Set. Your Sisters are blessed to have you and you them! Such a beautiful and cute stamp set, love your coloring. This set is going on my wish list. 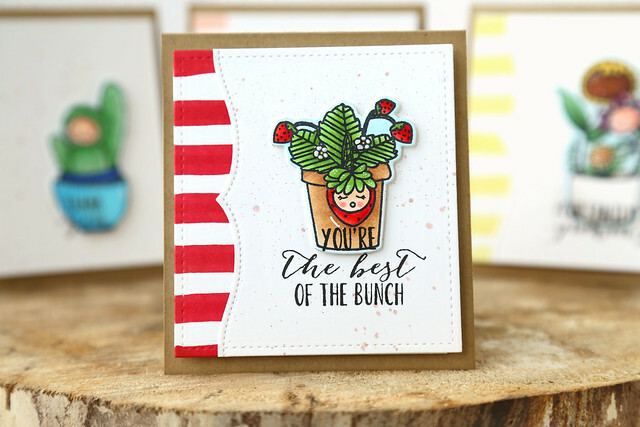 Love this potted pretties stamp set. Its so adorable! I can't wait to get this set! Just popping over from the ME blog to congratulate you on your stamp set. The images are adorable and I love that you can choose whether or not to use the faces. Also love the design of your set of cards. So pretty! your spring cards are so cute and sweet! Love your cards, they are so cute! Adorable! I'm pretty sure all the plants are talking to one another. Great set, good for many occasions. You're cards are just absolutely beautiful. I just love you're designs and coloring. Beautiful stamp set! Those lil face flowers are just adorable. They make me smile. Your cards are just too cute!!!!!!!!! The stamp set is awesome. The cards are darling and the stamps are so cute. Because of the way you designed them, I could easily make pop-up cards with them. Well done. Your designs are so lovely!!! I adore each and every one!!! Omg! Soooo cute! You're such a great artist! So cute! Glad I passed on the other cactus/succulent stamps sets that have come out lately... this is the one for me. Congratulations Elena on creating another FAB set! These cards are amazing! I love the bright coloring and that amazing spattering in the background! Oh my goodness, these are so adorable and I love having the faces peeking out. These are adorable!!! I love the little faces. Your coloring is amazing!! I can't even take how cute these little plants are! Love your designs! I have the alpine carolers and would love this one also! Can't wait for more from you! Simply adorable, love your designs and coloring! Such an adorable set and the cards you've made are just so sweet! 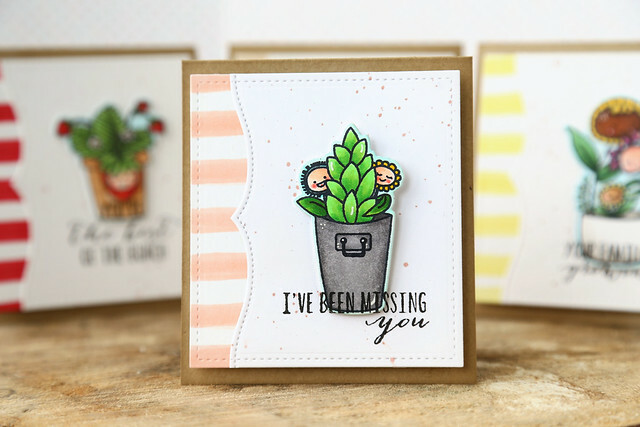 That Potted Pretties stamp set is way too cute for words! Your set of cards is soo cute. My favorite is the strawberry one as I love strawberries! These are so adorable. Love your cards! These are adorable. I hope I win a set. Your cards are super cute! Now how cute is this! It's such a sweet set, Elena! Congrats! 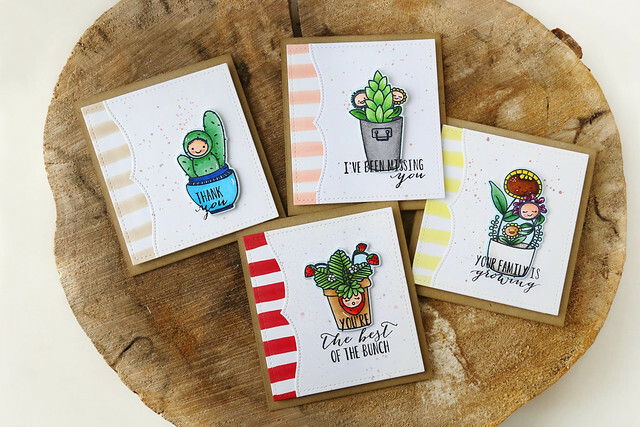 Thanks, Paulette S.
I have now become a succulent fan & these cards are adorable!!! Oh my gosh these are way too cute!!! Congrats on your first stamp set! I love their darling little faces! How darling and unique! This is sure to be a hit! Lovely images! Congratulations on your new set. I agree - faces make them even cuter! Congratulations!!! I love the new little faces and their pots! Congratulations on such a gorgeous stamp set. Your card samples are beautiful too. Your cards are very cute! Adorable cards. Very cute. Would love to get the set of stamps. These little note cards are just precious! Each one is a work of art! Happy 5th birthday, Lawn Fawn!